You can always see how many segments and how many documents were coded with selected codes as a table and diagram. Since the documents often correspond to specific cases (e.g. interviews), the following function can be used to quickly analyze for how many cases a particular topic has been coded. Activate the documents you want to include in your analysis. If you want to include all the documents, you don’t need to activate anything. 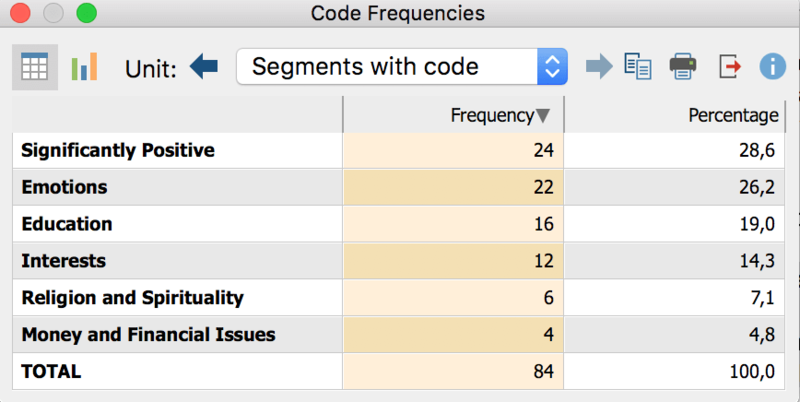 Start your analysis via Analysis > Code frequencies. After clicking OK the following frequency table will appear, which shows in how many documents the code occurs. 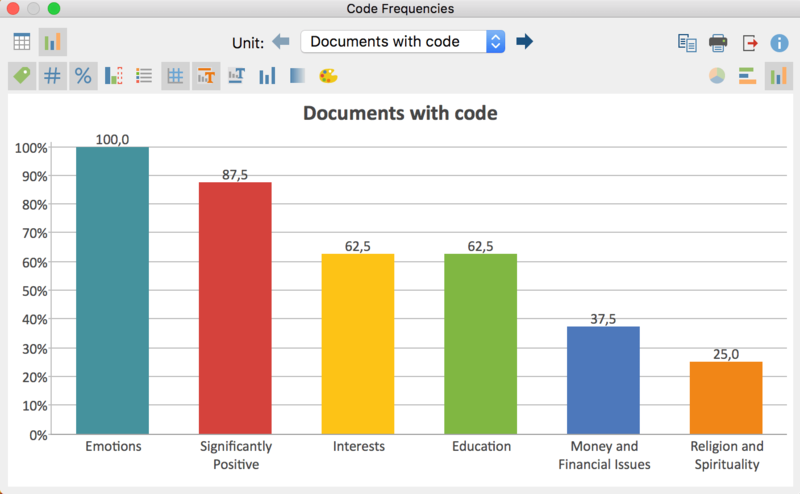 DOCUMENTS with code(s) – refers to the number of documents in which at least one of the analyzed codes occurs. DOCUMENTS without codes – refers to the number of documents in which none of the analyzed codes occur. ANALYZED DOCUMENTS – refers to the sum of the two numbers directly above and gives the number of all analyzed documents. 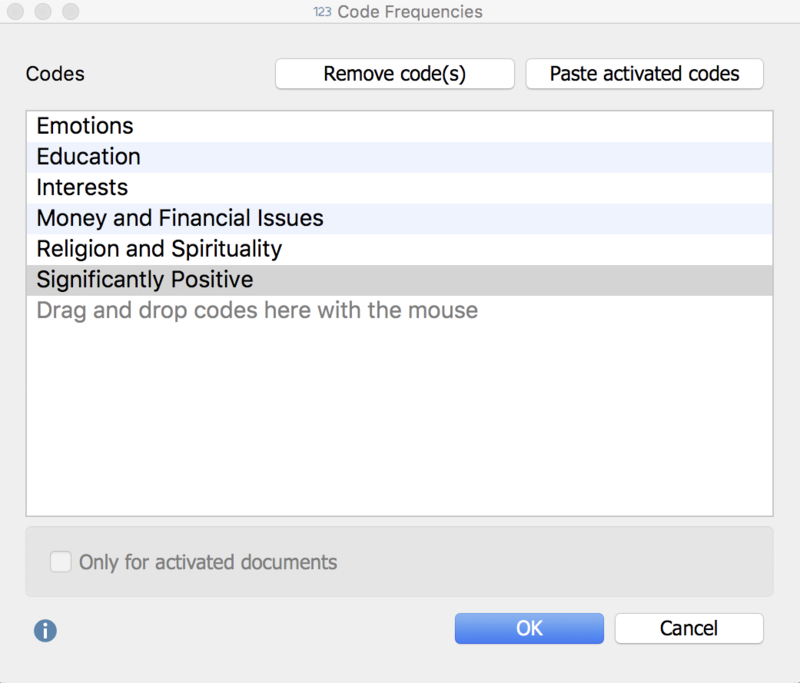 In the first row of the table above you can see that the “Emotions“ code occurs in 8 documents, which comes to 24.2% of the analyzed documents. If you click on the blue arrow in the toolbar, MAXQDA switches the display to “segments with code”. Segments are then counted rather than documents. The results table shows how many segments the listed codes have been assigned to in the selected documents. In the second line of the table you can see that the “Emotions” code has been assigned to 22 segments within the analyzed data. This corresponds to 26,2% of the analyzed coded segments. By clicking on the chart symbol in the upper left corner, the currently displayed frequency table can be displayed as a bar, column or circle chart. Refer to the Frequency Tables and Subcodes section for further information on charts. The current display can be printed and exported via the usual symbols on the top right corner of the window. Copy to clipboard – copies the current status to the clipboard to allow you to then paste it into a report, presentation or graphics software. Print – displays the printing dialog window for the currently displayed window. Export – In the table view, you can export the table to an Excel spreadsheet (XLS / X format) or a webpage (HTML format). A graph file is exported in PNG or SVG format. The EMF format is also available under Windows. Both the SVG and the EMF format are well-suited to being used for large posters due to their lossless scalability, but the SVG format cannot be directly imported into Microsoft Office products.